Pat O’Shea is better known as “Patio.” And, to beer drinkers in Bend, he is well known, even if not by first name. In the decade Patio has been working in town, the nomadic brewer has held court at four different breweries; currently, he stirs the mash at 10 Barrel. After heading westward in 1994, the Pennsylvania native started at Rock Bottom Brewery, one of the early brewpubs in Portland. He had no experience with home brewing, but he figured he was familiar enough with the end product. “I did a lot of drinking as a kid, and I always had a fondness for beer,” O’Shea says. With a little persistence, he convinced the assistant brew master at Rock Bottom to give him lessons on weekends. Eventually, he made his way into the brewery when it opened a location in Seattle. In those days, learning the trade happened on the job. A lot has changed in the past two decades, as the number of microbreweries has swelled from a few dozen around the country to about twentyfold. In 2013, the Brewers Association reported that there were currently 2,360 microbreweries in the U.S. Likewise, the profession has become more formal. Today, O’Shea says, it’s tough to get a brewery job without a degree. O’Shea worked for Rock Bottom for seven years before spending time at Anderson Valley in Northern California. Eventually, he was lured to Bend by a job with the all-mighty Deschutes Brewery. After three years there, O’Shea took a break to try distribution, but ultimately returned to brewing, picking up work with Three Creeks and Crux before ending up at 10 Barrel. “10 Barrel was such a great fit for me,” O’Shea says, adding that the all-star staff—and a brewmaster from Philadelphia—were major perks. 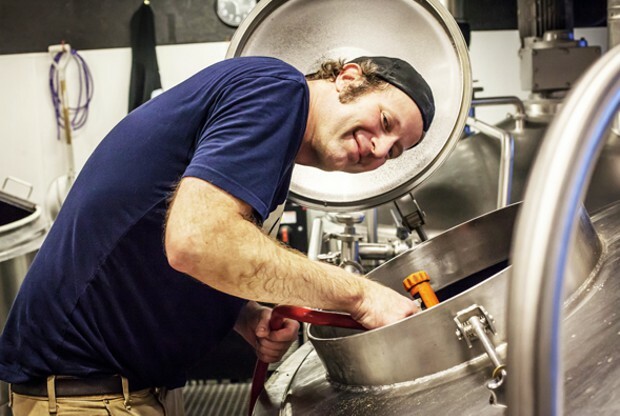 The brewery’s balance between mass-produced and small-scale brews allows O’Shea and his fellow brewers to make a consistent product while giving them an opportunity to get creative. “There are only four ingredients. It’s how you put those together that defines the beer,” O’Shea says. Not surprisingly, he draws inspiration from the very person who got him where he is today—that is, the person who saddles up to the bar on a stool, looking for something new. He explains that there is something magical about seeing an idea go from the mind, to the page, to the brew tank, and eventually, a pint glass in the hands of a satisfied drinker. O’Shea studied art as a kid, but these days, crafting beer is an all-encompassing passion. He works long hours on his feet, often returning to the brewery the afternoon after working the graveyard shift. But after nearly two decades of brewing, it’s hard for O’Shea to imagine doing anything else. In an alternate reality, the one-time broadcasting student says he could see himself talking football as a sports anchor on ESPN. When he does finally move on from brewing, he says he’ll likely stay involved in the close-knit craft brew community. For now, he’s continuing to make his mark on the local beer scene, both behind the barrels and out in the community—through beer drinking festivals like Little Woody, while mulling over the questions that continue to drive him. “For me, it’s, ‘What would I want to drink?’ What do the good drinking people of Bend deserve?” O’Shea says.